It is 2019. BBA and Bai Al Inah are Old News. WHY ARE YOU STILL ASKING ME ABOUT BBA AND BAI AL INAH? 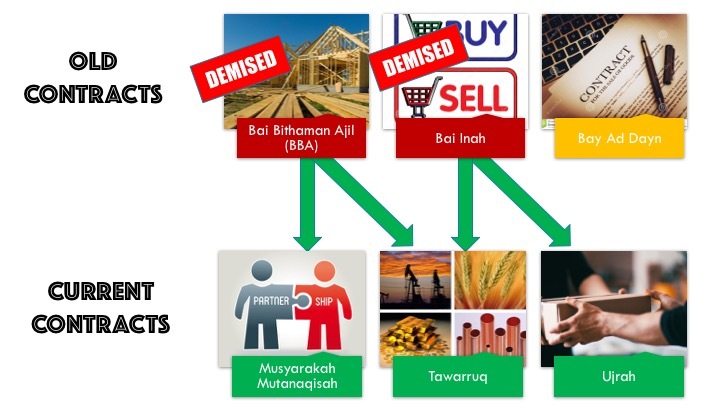 It remains a mystery when people ask me why Malaysia continues to offer Bai Bithaman Ajil (BBA) and Bai Al Inah products, as according to them, these structures are based on elements of Hilah (trickery). It is a mystery because starting from 2012/2013 period, the instructions on Interconditionality issued by BNM to Islamic Financial Institutions requires that the provisions of “mandatory buy-back” must not appear in financing contracts such as Bai Inah and BBA. Because of this, Malaysian Islamic Banks have slowly weaned itself from such products and have since moved to other Islamic contracts. Read the circular issued by Bank Negara Malaysia in 2012 on the practice of Bai Inah and their expectations by clicking this link (BNM Circular). In general, I still find that some learning institutions are incorrectly teaching students that the contracts are still alive and well in the Malaysian market. The text books used are still ones that predates 2011 and really, this is a disservice to students. When they come for interviews with our bank, it does not give the students any advantage or good impression as the syllabus remains outdated. Many do not know about the Policy Documents issued by Bank Negara Malaysia or the contracts covered by the policy documents. This really should be covered in a learning module as the latest requirements are captured in these documents. It is a good reference read, but it seems only practitioners and Shariah scholars are aware of these documents. This is true as my last few interns also impressed the same. Tawarruq structures sounds alien to some of them, as their teachers prefer to teach BBA and Bai Inah to unlock its controversies as points for discussion. Let us be clear that most banks NO LONGER offer Bai Inah or BBA, and those which does, offer it as a continuation for a legacy arrangement or due to certain unavailable scenarios, such as fresh new documentations are not obtained for Tawarruq arrangement (such as Wakalah to buy commodities). It is no longer offered as a product to the public and this is evidenced from the Banks website where the structures can no longer be found. And most of the time if used, this is a temporary fix allowed until the deal reaches expiry or the Tawarruq appointments are obtained. And with Tawarruq arrangements now being ably supported by good infrastructure such as Bursa Suq As Sila trading platform and other commodity brokers worldwide, there is no issue of Darurah (emergency) to justify the continued usage of Bai Al Inah or BBA. SO, WHERE HAVE WE GONE TO SINCE 2011? Bai Bithaman Ajil (BBA) – Usually BBA is used for purchasing of properties (Home financing or Commercial properties financing), or sometimes for trade financing products. These usage is now done under the Tawarruq arrangement (using Commodity Murabahah) where the proceeds from the sale of Commodities is used to settle the purchases of houses or commercial properties. Alternatively, Musyarakah Mutanaqisah arrangement (Diminishing Partnership) is also used by many banks where houses or properties are purchased by the Bank and leased out to the customer, who then pays rental and gradually purchases the shares of the house and properties over time. So now, BBA has been replaced with Islamic arrangements of Tawarruq or Musyarakah Mutanaqisah. Other Islamic contracts has also been known to support some elements of BBA, such as Istisna’a (property construction), Murabahah (good sale at profit) or Ijarah / Ijarah Mausufah fi Dhimmah (forward lease). Bai Al Inah – Usually Bai Inah is deployed for Personal Financing or Working Capital Financing and even Islamic Credit Cards. Again, Tawarruq arrangements has generally replaced these usage with the end result of providing cash. On a smaller note, the contract of Ujrah (Services) is also deployed to support some requirements of personal financing (where purchase of goods and services are required) and Islamic Credit Cards. So now, Bai Al Inah has now been replaced by Tawarruq arrangements or Ujrah contract to meet the cash and working capital requirements. The final controversial contract that Malaysia currently deploy is the Bay Ad Dayn (Discounted Sale of Debt), which serves a specific purpose in trade financing products. Eventually a common ground must be found to make this contract more globally accepted, or replaced with a better solution. The main challenge nowadays is to innovate further by improving what we have. Criticisms are good, especially on the old structures. But we practitioners do hope the learning academia afford us a bit more confidence and trust, especially these criticisms and consequent issues are not “unknown” to us, since we lived and breathed in its controversies many years ago. The comments made in recent times are something we had encountered and resolved 10 years ago. We enhance and evolve, and it will be good to see new students coming into the market armed with the latest updates of what is happening and let’s move forward. It is now 2019. Do not get stuck in the muddy past. These contracts have gone into the history books. We have so much to do in the future arena. Recently, the topic of Tawarruq & Commodity Murabahah has been popular in the industry as both BNM and Shariah scholar have been asking operational questions on the implementation of Tawarruq arrangement in the industry. It seems, even with the Policy Documents, there are still some divergence in terms of operations and understanding of the minimum Shariah requirements for Tawarruq. Each financial institutions have their own operational abilities and processes that differs from one another; to have a standardised platform may be a bigger challenge than imagined. The rise of Tawarruq in recent years should really not be a surprise to many observers. We are seeing that most financial institutions in Malaysia now consider a Tawarruq structure a “must have”, because there really is no options as other Banks also deals in it. It has become norm, and while scholars might take a view that Tawarruq should be a “last resort” option, there have been so much effort invested into making Tawarruq an efficient machine. Just take a look at the Bursa Suq Al Sila and what it is capable today. Question : Is it Cash or Committed Limit? The latest consideration of Tawarruq is on the treatment of Tawarruq funds after the transaction. What is it exactly and how is it been managed within the Bank, with the Capital Adequacy Framework for Islamic Banks (CAFIB) implemented a few years ago (latest update this year 2017). In particular, when a customer is approved a certain limit (let’s say $1,000,000) and a single Tawarruq is done for $1,000,000 for the line (instead of multiple small Tawarruq for each usage of the amount within the $1,000,000 limit), where does the money goes, and what is it exactly in the eyes of Sharia? To clarify, upon the completion of Tawarruq, real money of $1,000,000 is generated. Cash. It is not a “line” in the conventional terms, but it is money (actual cash) now belonging to the customer. He can draw out the money anytime. But the practice is that the money is kept in the Bank’s books unless requested by the Customer, and by keeping this the Bank will give a “rebate” on the money kept in the Bank, similar treatment as if a “principal payment” is made (although it is re-drawable). In the meantime, the Bank utilises the money (taken as principal payment made) for its own banking business activities. The Tawarruq is done on a single transaction for the full amount, therefore it is a full release of capital (i.e. fully funded). As such, it should have a “capital charge” consideration if it is not fully utilised by the customer. Bank has released fully the funds to customer (therefore Bank should be entitled to earn a full profit on the amount). The formula for profit would be $1,000,000 x Profit Rate – Cost of Capital. Note the Cost of Capital is on the full amount. Then, the subsequent mechanism instead is as follows: since the customer did not fully utilise the funds, the customer is given a “rebate”. For example the customer only uses $50,000 of the $1,000,000. The formula for rebate is that ($1,000,000 less $50,000 = $950,000) x Profit Rate x period unutilised. Banks earn full Profit Rate on $50,000 and gives rebate based on $950,000. Of course, Banks will utilise the $950,000 meanwhile but at what I imagine are for short-term instruments because the $950,000 is customer’s money (i.e. committed amount) and can be requested at anytime. Bank needs the funds to be as liquid as possible. So the Bank do not earn a lot from this “short term investment”. Also, there is concurrent discussion as to when the amount is kept and used by the Bank, what is the underlying contract used for this “unutilised, principal payment which is drawable on demand” amount? Is it kept by the Bank as Qard (loan), Wadiah (safekeeping), Amanah (trust) or can it be taken as Tawarruq deposit (monetised obligation) or Mudharaba (investments)? Different Banks have differing views on this, but I suspect BNM is trying to standardise this understanding and practice. But more importantly, while the Bank is giving customers “rebate” on the amount they do not utilise (but committed by the Bank), is there also “rebate” on Cost of Capital then? It seems unfair when it doesn’t. Tawarruq proceeds are deemed fully drawdown (based on full amount) and incurs full Capital Charge but is earning returns based on “only” the utilised amount. The rebate formula is very specific, and it does not contain the amount for “rebate” Capital Charge. On the amount unutilised i.e. $950,000 the Bank will charge a “Commitment Fee” of 1.0% per annum (or any negotiated rate) on the unutilised (but committed) portion. While 1.0% per annum do not usually cover the full Capital Charge on the $950,000 it somewhat compensates the charge as the Bank (because $950,000 is still a “limit” and not Cash payout) can still use the unutilised amount in its day to day banking activities i.e. investment in short term financial instruments. Scholars generally do not agree with the concept of Commitment Fees, and there is specific BNM guidelines prohibiting the charge of Commitment Fees in these specific scenarios. I still think there is a disconnect somewhere that while we aim to achieve the same end result by the practice of Ibra’ i.e. “Rebate”, but with Capital Cost coming into play, it may eventually seem that the cost of running an Islamic Banking business can be higher than a conventional Bank. It really depends on how we interpret the guidelines and the treatment on Tawarruq especially the single Tawarruq structure where the full amount is transacted i.e. whether it is a full Capital Charge or otherwise. I know what BNM usually advise i.e. it is a full Capital Charge. But this concurrently means, without Commitment Fees on the unutilised Customer portion, it may result in extra costs for the Bank. Now I am not suggesting we introduce Commitment Fees for Islamic Banking; this idea of Commitment Fees is a conventional banking concept for recovering opportunity costs, which may not sit well under Shariah consideration. But in the world we operate today (where each $$$ is risk weighted to a cost), this translates to “Actual Costs” incurred by the Bank, based on the interpretation for the “single full amount Tawarruq transaction”. And Shariah may want to consider this as it is a real “Actual Costs” and not opportunity costs. By letting the money sit still, the Bank incur real, actual costs which is not recoverable as per guidelines. It may have started as “recovering opportunity costs” but if you really think about it, this is above opportunity costs. Maybe in the conventional space, they may even revise Commitment Fees to recover BOTH Opportunity Costs as well as Capital Charge. So, my question is this: should both the industry and Shariah scholars re-look at the basis of Commitment Fees (in the context of how Tawarruq works), or re-think about the “Rebate” mechanism and perhaps have an adjusted formula to factor in a “Rebate on the Capital Charge”? Can Shariah consider this mechanism to recover a real cost incurred by an Islamic Bank? In the meantime, Happy Ramadhan to all, and may you have blessed month ahead. 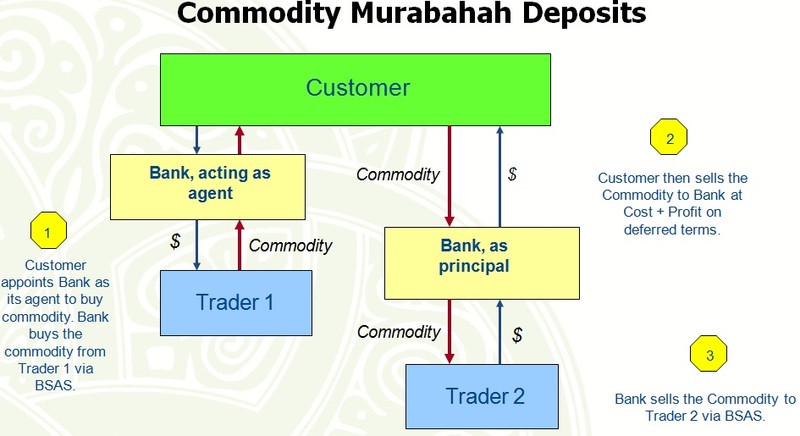 A few days ago, several Banks in Malaysia officially made available Deposit products based on Commodity Murabaha transactions. 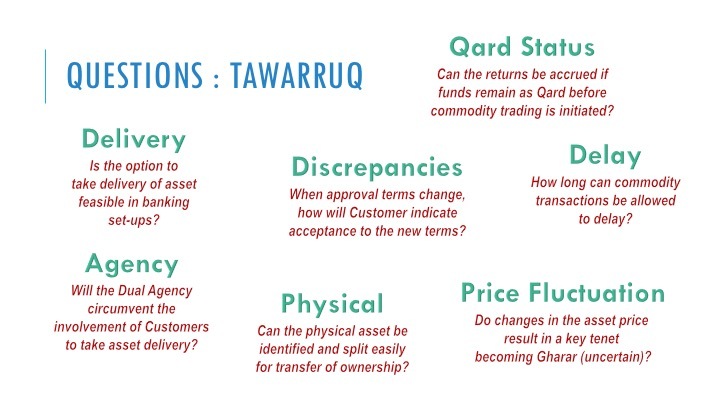 Looks like Commodity Murabaha (CM), or in another variation is called “Tawarruq” has now expanded its domain from Financing-based to Deposit-based products. More and more banks will have to rely on this structure on both sides of the balance sheet. 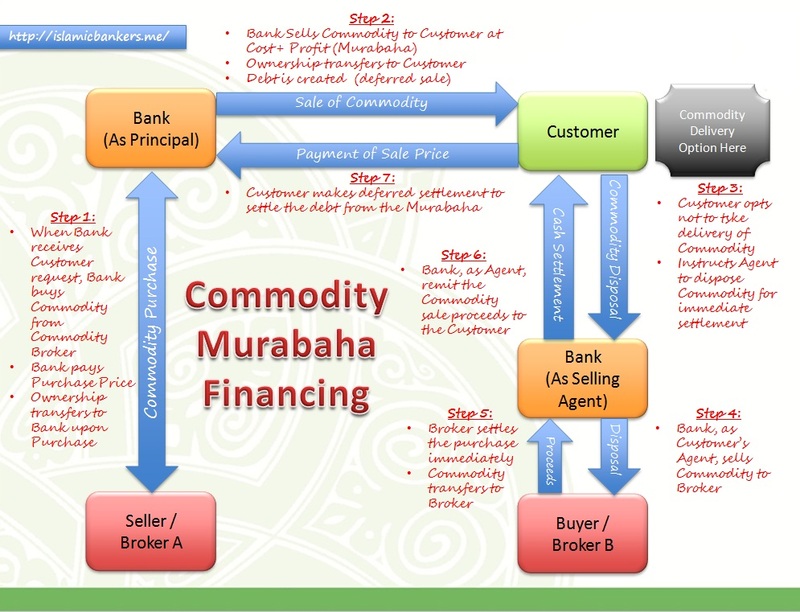 Bai-Inah based portfolio used to consist of nearly 80% of the overall financing portfolio of some banks; now with the push for Commodity Murabaha structures in financing to avoid interconditionality issues in Bai-Inah, it is expected that Commodity Murabaha financing to eventually replace the Bai-Inah portfolio. Now with the introduction of CM for Deposits, the popularity of commodities will take a sharp rise! Bursa Malaysia will have their hands busy supplying the industry with commodities to support the underlying transactions. Islamic bankers will also have their hands full buying and selling commodities between the bourse and the customers, either as buying agents or principal purchasers! I am not sure whether this is necessarily a good thing. The industry will now shift from having a Bai-Inah-heavy portfolio into a Commodity-Murabaha-heavy portfolio. Concentration risks towards one Islamic contract will grow, and the question is that whether Banks will take the time to develop other contracts into viable propositions instead of just building the CM infrastructure. Do bear in mind that a lot of infrastructural work needs to be done to ensure CM remains the flagship contract for years to come. The specific risks that Banks faced when offering CM products are manifold; shortage of commodities, delays in transactions, wrong sequencing of purchase and sale of commodity, errors in commodity prices and description, delivery of commodities issues, ownership issues and ownership evidencing. All these requirements needs to be watertight to ensure income from these CM transactions don’t just go to charity. Whenever there is an Asset involved in the transaction, all the factors need to come together to ensure Sharia compliance. And the way we are going, it seems that CM will probably have 80% of the financing pie and 70% of the deposits pie in a typical Islamic Bank’s balance sheet in 3-5 years time. With IFSA deadlines on June 2015, this ratio could come sooner rather than later. Will the development of other contracts be further left behind since the shift now is on CM? Maybe, historically Malaysian Banks follows the “Urf Tijari” route of following what the other bank is doing. We have seen this when Bai Bithaman Ajil (BBA) was introduced; nothing else was developed in the market but BBA. It was the same with Bai Inah. But there is other opportunities for development of other Islamic contracts, although I don’t imagine this is the case for Malaysia while we busy ourself becoming commodity traders. Oman, on the other hand, has rejected tawarruq totally, focusing on other contracts such as Ijara and Musyaraka. This is a good development, as no countries has seriously looked at developing complex, high-risk structures. Maybe once the thinking to shift to understand the transactional and Sharia risks of the new products is made, perhaps the market can warm up to the idea that Sharia compliant banking can be a different way of banking. The following is what I understood from the various Exposure Drafts issued by BNM on 9 December 2013. Of the 7 exposure drafts that we received, I have earlier summarised the Wadiah Exposure Draft, and I will ignore the Bai-Inah Exposure Draft as we are no longer subscribing to the Bai Inah structure at the workplace. Please find the remaining Exposure Draft review for your understanding. 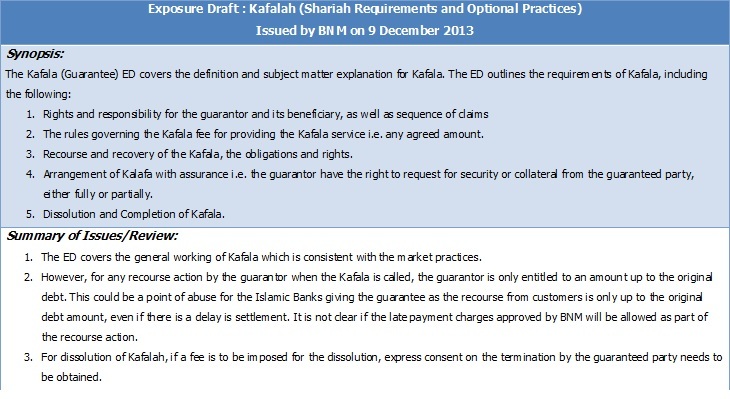 2013 ED – Kafalah – One of the key issues for a Kafala (Guarantee) contract is the charging of fees for providing the guarantee services. The main issue has always been the quantum of fees charged, either in percentage of the financing or via a fixed charge for all financing amount. The justification of this charge is always tricky, because technically the fee should not be imposed if there is no call for the guarantee (in cases of no default). The guarantee will only materialise if the customer defaults, that’s when the work happens to justify any fees. Issuing a piece of paper at the start of the relationship to guarantee the amount does not amount to too much work, and there no funds disbursed to any parties (unfunded). To justify the charging of any fees based on percentage instead of actual work, especially for huge amounts of financing guarantee, can be problematic to justify in the eyes of Sharia. 2013 ED – Wa’d – At one point of time, Wa’ad (Promise) seems to be the answer to many structures, where a promise is given without any requirement to transact before a specific event. The terms therefore can be negotiated and re-negotiated without the need to strictly specify the terms of the transaction and re-signing of documents. This gives a lot of leeway for deals to happen.However, at the end of the day, Wa’ad remains as only a promise, legally distanced from a contract or an agreement. Enforcement at the courts are therefore without full confirmation of all the terms, and makes for a loose structure and potential disputes. This flexibility and enforceability remains one of the key risks to a Wa’ad contract, which is why until today Wa’ad is generally transacted between known parties i.e. between established and trusted Financial Institutions. 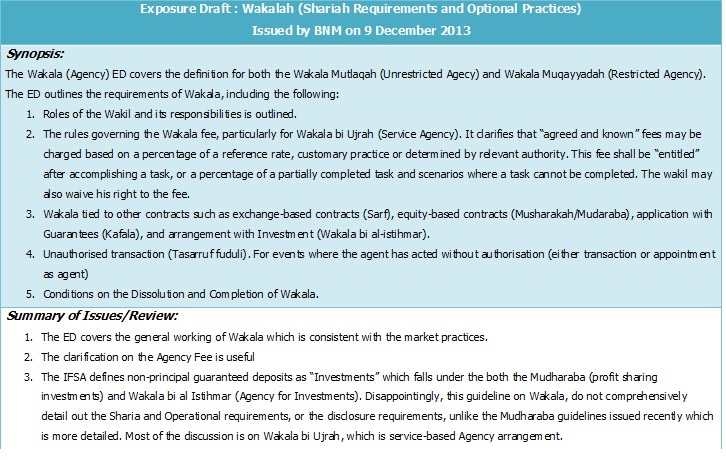 2013 ED – Wakalah – Wakala (Agency) will remain an integral contract for Islamic Banking as it validates a lot of action that can be done by the Bank, in order to remain efficient. In general, Banks hold a lot of expertise in various fields, such as investments, financing, leasing and trading; something a normal customer may not want to be involved in on a daily basis. An Agency arrangement conveniently provides for this. Anything that improves the efficiency by leveraging on the Bank’s expertise and infrastructure, can be arranged via Agency. However, the way we practice it usually is transparent to the customer. In practice, Agency Fees are the right of the Agent, and the waiver of such fees, although allowed, is sometime seen as not adhering to the spirit of Agency and entrepreneurship. You do the work as an Agent, but don’t earn any fees as it is waived. In real life, this does not happen as whenever a work is completed, you should earn something. 2013 ED – Tawarruq – As Tawarruq (Three-party Murabaha Sale) becomes more prominent in the Malaysian market, I was surprised that the ED was not more comprehensive than this. There are sequencing issues not addressed but more importantly, there is a lack of illustration on what is defined as Tawarruq. Is there any difference between a Tawarruq and Commodity Murabaha, which essentially is a 4 party transaction? The issue of interconditionality is adequately addressed in the ED but I would love to have seen more details related to products, such as for Islamic Credit Cards and Revolving Credit with a rebate structure (Ibra’) based on a floating rate financing. It mentions that the discount can be given based on certain benchmark agreed by the contracting parties. This opens the clause to various interpretation as it is without real detail. I will look at the Hibah (Gift) ED but essentially, it is related to the Wadiah ED. Most of what’s covered under the Hibah ED is relevant to the Wadiah product, such as the discretionary Hibah issue and the giving of Hibah becoming a business practice (Urf Tijari) which can be construed as Riba (Usury). Wait for the posting. Thank you for reading, hope everyone have an enjoyable holiday period ahead. Wasalam. Today we are given additional reading materials; Exposure Drafts!!! By my last count, 7 new Exposure Drafts was published by BNM yesterday and now it is time to digest them. As it is, there is so many to digest already. Quick and fast after the Bai-Inah clarifications in late 2012, we were given tight deadlines for the IFSA bill to comply. Add to that, the IFSA “forces” us to re-look at the Investment Account Concept Paper and the Rate of Return Framework if we were to look at retaining a Mudaraba or Wakala deposit structure. Then comes the deadline that the compliance to the Investment Account concept paper is to be met by 30 June 2014. More sleepless nights? Yes, especially since the industry is struggling in coming up with a Current Account Savings Account alternative to Mudaraba. And generally, Exposure Draft is like the engagement before a marriage. You may give feedback, but the deal is already on. It is just a formality. This will make for an interesting reading, and an even more interesting new year. It looks like it’s going to be a very busy year in Malaysia. It was with surprise that the Islamic Banking practitioners are called to Bank Negara Malaysia (BNM) for the briefing pertaining the use of the contract of Bai Inah. The date was 16th November 2012 and it was a packed room at Sasana Kijang. Something was in the air, and little did we know that it is a meeting the Bai-Inah will be officially “killed” in that meeting. But before we go further, BNM again reiterate that there is nothing wrong with the Bai-Inah as a concept, and the contract is valid in practice. However, the main concern that BNM has were mainly on the way the contract is executed, that it no longer reflects the orginal intention envisioned for the contract. One of the key issues that BNM highlighted is on the issue of “Interconditionality”. This simply means that should if one party sells its asset to another party, at a selling price, the original owner of the asset should not impose on the other party to on-sell it back to the original owner. One party should not compel the other party to re-sell the asset back to the same party. This smacks of shades of “arranged trade” i.e. the use of hilah to validate an Islamic sale, and this compulsion is explicitly captured in legal documents to protect the interests of the original owner. Interconditionality means that for the customer to obtain cash, the customer MUST sell back the asset to the Bank, and failure to do so will result in the whole transaction being void, even if the first sale contract has been completed and concluded. This doesn’t invalidate the Bai-Inah transaction in the first place, as it is a “willing buyer willing seller” scenario. But the issue arises where the buyer is not willing; what is his options then? BNM highlighted that the Bai-Inah structure must therefore remove the “interconditionality” where the customer is compelled to sell back the asset to the Bank. The customer, as in any real trade, must be given the option to either sell the asset back to the Bank, or sell it on the open market, where the customer takes the pricing risks for such sale. The contention is that the Bank must not compel the customer to only trade with the Bank, but also provide an option to sell this asset into the open market. 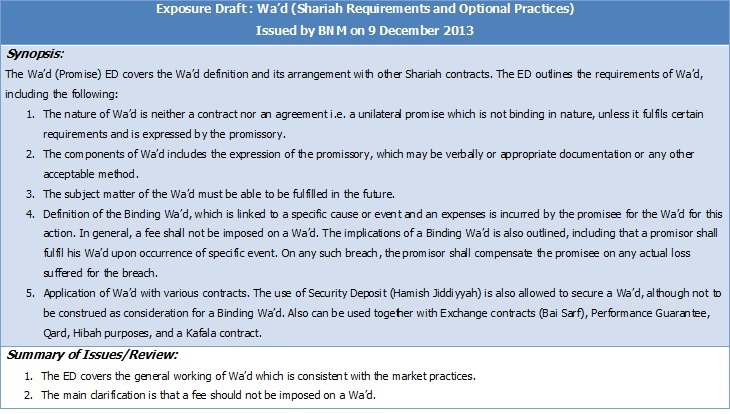 This effectively separates the Bai-Inah contract into 2 separate Murabaha contract i.e. the second contract is for the customer to on-sell the Asset now owned by him to a third party or if he chooses, back to the Bank. The customer may even keep the Asset in his ownership, while paying off the debt to the Bank. One contract will therefore not be dependant on the other i.e. the interconditionalty of the sale is now removed. The uproar in the industry was therefore expected. Many Islamic Banks have built up a substantial portfolio for their personal financing, credit cards and corporate working capital based on the contract of Bai-Inah. The options given by BNM was to either comply with the removal of the interconditionality in the Bai-Inah contract, or move to another contract where interconditionality is less than a problem, such as a Tawarruq or Commodity Murabaha structure. Many Banks have chosen the route of trying to comply with the removal of interconditionality, while other Banks view that the Tawarruq option was the right direction. Personally, I feel trying to comply with the Bai-Inah requirements without “interconditionality” is at best a temporary measure. 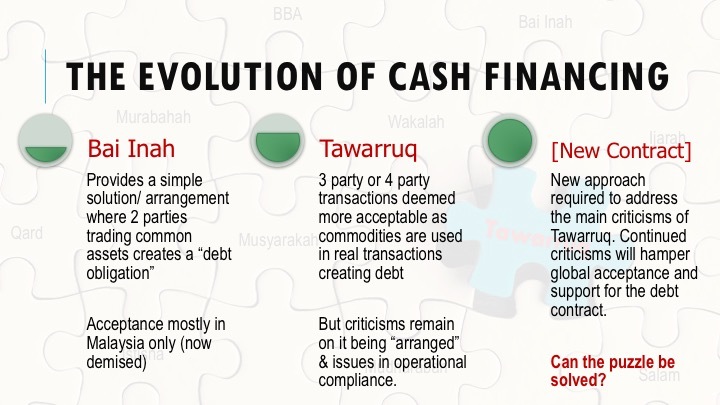 The way forward is to look at the Sharia structure of Tawarruq (Commodity Murabaha) and finding ways of making it efficient as soon as possible. This will be the key driver in the Islamic Banking industry in the coming year. And the death of Bai-Inah will be good news for our Middle-Eastern colleagues; one less controversial contract to talk about. Like I said. It’s going to be a busy, busy year for us, as BNM gave the Banks until 30th January 2013 to either buck up or ship out. Time to burn that midnight oil.